One autumn/winter 2018 trend that Zara has heavily invested in is coloured checks. This print has long been an autumn staple, but checks have been given a brighter makeover by designers like Tibi, Isa Arfen and Versace. "Traditional checks have been at the forefront of the trends for several seasons," says Lisa Aiken, Net-a-Porter's retail fashion director. "Our more directional brands have experimented with colour to give our woman a reason to buy new." When it comes to colours, burnt oranges are the most popular shade this month. Amongst the dozens of check pieces on Zara right now there's one that has become a firm influencer favourite? A pumpkin-coloured checked pencil skirt. 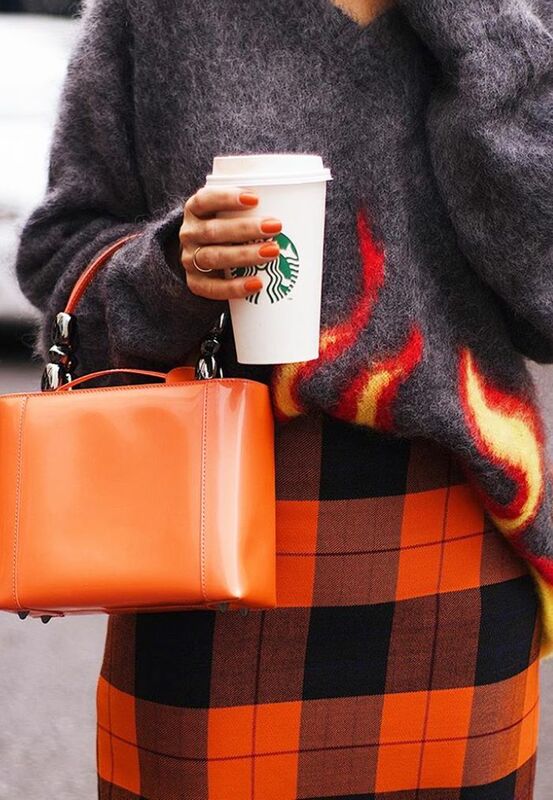 Style Notes: The orange checks look amazing with this flame jumper and matching orange handbag. Style Notes: This orange check goes perfectly with vibrant knitwear and bright white accessories. Next up, shop our guide to the key trends for autumn/winter 2018.